Dhaka, July 29 (Just News): Bangladesh Nationalist Party on Sunday announced that the party would stay till last time in the field of battle of mayoral elections in Rajshahi, Barisal and Sylhet cities scheduled for Monday although symptom of fair elections was yet to visible. 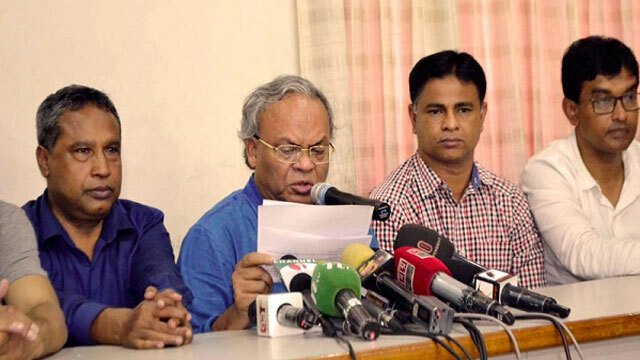 BNP senior joint secretary general Ruhul Kabir Rizvi declared the party’s stand at a news briefing at the party’s central office bringing allegation of arrest, intimidation, filing ‘false’ cases and raid the houses of its leaders and activists in three cities ahead of the polls. He cautioned that the government would not have power to check the flow of political situation to be erupted after witnessing the Monday’s city polls. People will no more sit in idle, he said adding that siren would be ringed until the fall of the government. Rizvi said police on Saturday night arrested BNP’s Sylhet city corporation poll campaign committee member secretary, Abdur Razzak, also the party’s central assistant small credit affairs secretary. He allged that supporters of ruling party’s mayor candidate in Sylhet planned way exploded crude bomb to implicate in BNP leaders and activists by filing false case. He alleged that local administration nakedly working for the candidate of boat, election symbol of Awami League. Rizvi said in Rajshahi police and administration were jointly involved in ‘lawlessness’ to hold unilateral polls in favour of the boat symbol. He said election campaign offices of mayor candidate of sheaf of paddy, BNP’s election symbol, were closed across the Rajshahi city. Allegation raised that additional stamped ballot papers were brought to Rajshahi from Dhaka by black car, Rizvi said. The BNP leader claimed that Barishal is now under the possession of ‘Awami cadres’.